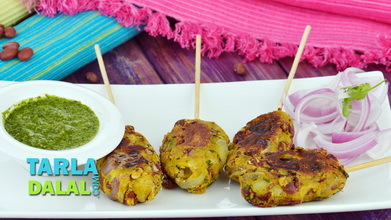 Perfect Chana Dal Seekh Kebab, made with the ideal proportions of chana dal, raw banana and shredded cabbage, excitingly flavoured with mint, green chillies and spice powders, can be served as a starter or as an accompaniment to tea. 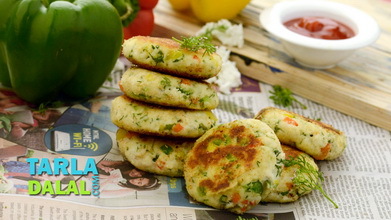 What makes this recipe different from other kebab recipes is that the chana dal is neither soaked not cooked, but roasted and powdered before adding to the dough. 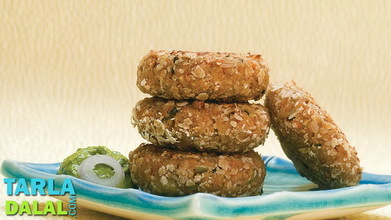 This imparts a rich aroma and a luxuriant texture to the kebabs, which is sure to attract everybody. Heat 1 tbsp of oil in a broad non-stick pan, add the chana dal and sauté on a slow flame for 3 to 4 minutes. 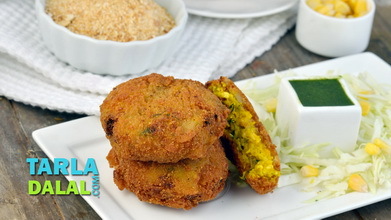 Cool slightly and grind the chana dal to a powder. Keep aside. Heat the remaining 2 tbsp of oil in the same pan, add the cabbage and sauté on a medium flame for 1 to 2 minutes. 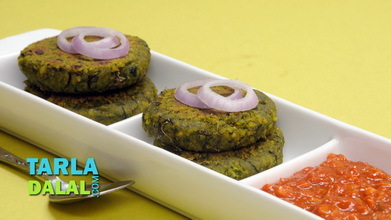 Add the bananas, green chillies and mint leaves, mix well and cook on a medium flame for 1 to 2 minutes, while stirring occasionally. Remove from the flame and blend in a mixer to a smooth paste without using any water. Keep aside. 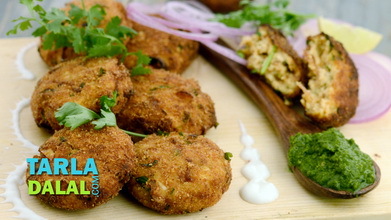 Combine the chana dal powder, raw banana paste, salt, dry ginger powder, chaat masala and garam masala and mix well. Divide the mixture into 4 equal portions and shape each portion into 75 mm. 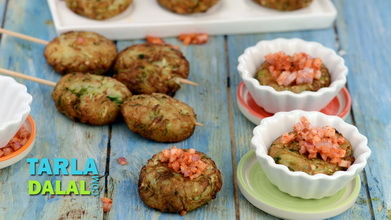 (3") oval kebabs. Heat a non-stick tava (griddle), grease it with oil and cook the kebabs on a medium flame using a little oil till they turn golden brown in colour from both the sides. 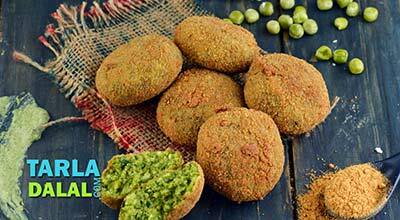 Sprinkle some chaat masala evenly on the kebabs and serve immediately with green chutney.